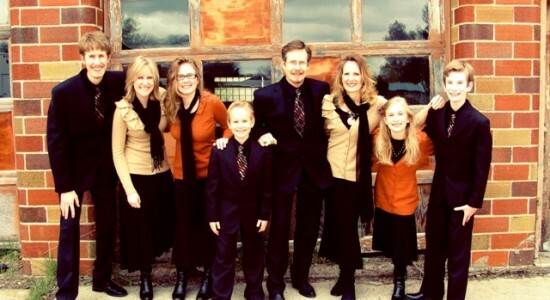 Bio: Since 2008, David and Kris Garms, and six of their eight children (Ben, Taylor, Leesha, Sam, Jayme, and Caleb) have performed at many different venues across Minnesota, Wisconsin, Nebraska, and Iowa. Since their simple beginnings of singing hymns and Southern Gospel classics around the piano in the living room to the release of their second CD, At the Right Time, the family has been endearing themselves to people across the Midwest as they travel together in their full-time ministry. You will enjoy The Garms Family’s vast variety and uplifting style of gospel music, including gospel bluegrass, Southern Gospel, and traditional hymns. Each song is an adventure as this live family band plays a wide variety of instruments: guitar, banjo, mandolin, fiddle, dobro, upright bass, harmonica, piano and more. Combining their exciting musical arrangements and beautiful harmonies, the energetic family is eager to share their homegrown talents! This homeschooled family love to work as a team, and their joy as family overflows as they sing and play together. At a Garms Family concert, you never know what surprise may await you. Who knows? They might all switch instruments with each other! But above all, the Garms Family is passionate about the Gospel of Jesus Christ and loves to share the message with young and old, wherever they go. They are quick to point to the Lord as the Giver of their gifts and give Him all the glory. Their smiles, gospel music, and the message of Jesus Christ will brighten your day, give you hope for tomorrow, and leave you inspired. You will blessed and encouraged, moved to laughter and tears, and your soul will be directed heavenward by this anointed family.